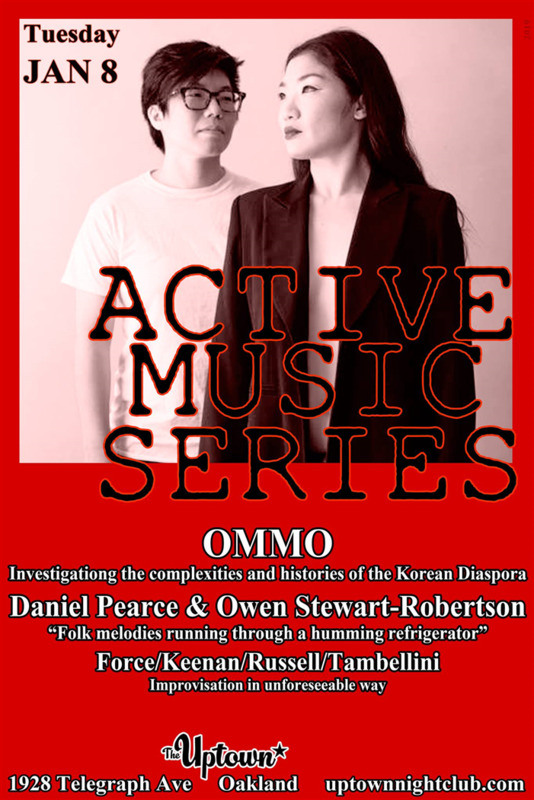 Julie Moon & Adria Otte’s OMMO began in 2014 as a platform to investigate the complexities and histories of the Korean diaspora and their places within it. The duo’s unique compositions may be experienced as evocative, atmospheric soundscapes which create an abstract yet fertile space for these investigations. Configurations of voice, analog and digital electronics, free and structured improvisations, as well as theater, ritual and song, may all be employed in the process. In their duo, guitarist Owen Stewart-Robertson and drummer Daniel Pearce produce a gentle improvised music that thinks hard against itself, second-guessing its own tonality and rhythm and palette, neither fully failing nor fully succeeding to break through into that which it seeks. Folk melodies run through a humming refrigerator, chopped-and-unscrewed back-porch tunes, fastidious recreations of the lonely music heard by a deep-sea diver, etc. Force/Keenan/Russell/Tambellini form a quartet comprised of violin, bass guitar, percussion and trumpet (respectively). The four musicians met during their time studying at Mills College in Oakland. Through various compositional prompts, the group improvises in unforeseen ways.